Something about ruffles make you feel dressed up even on casual days. Here, cascading ruffle cuffs create a dramatic silhouette in contrast with the simple bateau neckline. 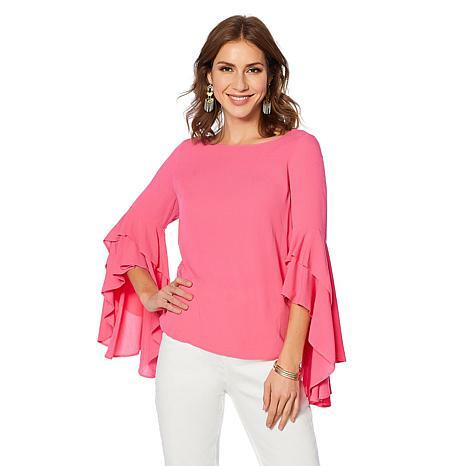 This blouse is true to size, I purchased the bright green, It is a beautiful fun color and looks great against my olive skin tone. I love the material and Im in love with its dramatic ruffle sleeves. 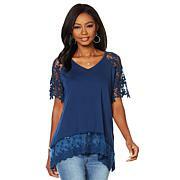 Ruffles Rule in this GREAT TOP! 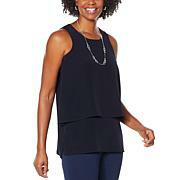 Diane Gilman is really famous for her great fitting jeans but she knocked it out of the park with this top. I usually wear a 1x but an XL fits as well. This is the FOURTH color I have purchased as they go great with everything. 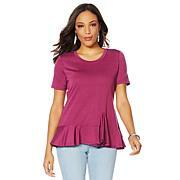 The ruffles do indeed "cascade" beautifully and don't get in the way as they do in many bell-sleeved ruffled tops. I prefer to hand wash & it still looks new! The sale price made it a steal. Thanks, Diane! Please bring us more tops to go with your great jeans. Festive season is here, it's essential to have a blouse that seamlessly transitions from work spaces to the social places with effortlessness. Top it over fitted skirts with tights and pumps or your best denim and boots.